EXETER – You can take a walk with your dog on Saturday, March 30 and make a difference. 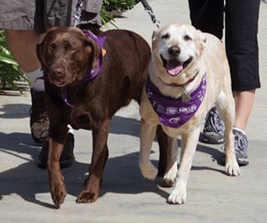 The Exeter Bark for Life walk takes place from 9 a.m. to 12 p.m. at the Exeter Bark Park. It is a noncompetitive walk for dogs and their owners to raise awareness and funds for the American Cancer Society’s fight against cancer. There is no pre-registration, you need only show up. And while the event is free, donations to the American Cancer Society are certainly welcome. Although absent last year, Exeter has held the event in the past, according to event coordinator Heather Taylor. In 2017 approximately 50 people attended with 30 dogs. Following a brief walk around town, participants will enjoy games, demonstrations, and vendors. “We will have a demonstration from the Tulare County Sheriff’s Office K-9 Department,” Taylor said. “Also, the Assistance Service Dog Educational center will be there to talk about service dogs. The American Cancer Society’s Bark for Life honors cancer survivors, pays tribute to loved ones lost and remembers those who are still fighting the disease. The Exeter Bark for Life event is a short noncompetitive walk for dogs and their owners to create a world with less cancer and more birthdays. The Exeter Bark Park is located across the street from City Hall at 137 N. F St.
For more information about Bark for Life, visit relayforlife.org or call 1-800-227-2345.